Mangroves occur across the Pacific islands with the world’s centre of species biodiversity in Papua New Guinea, and attenuation in diversity to the East. The largest mangrove areas are found in the Melanesia region. In particular, Papua New Guinea supports over 70% of the region’s mangrove area with at least 34 obligate species (i.e. found only in mangroves). Pacific Islanders were and still are traditionally coastal resource based, with many early settlements close to mangrove areas. They continue to provide significant social, economic and cultural benefits for the people of the Pacific. More information about Mangroves in Oceania can be found here. Mangrove Ecosystems in Fiji, as elsewhere in the world are generally associated with riverine/esturine deltas and sheltered coastline with low energy waves. The total mangrove area in Fiji has been variably reported as between 19,700ha and 49,777ha. The report by Watling, ‘A Mangrove Management Plan for Fiji Phase 1, 1985’, estimated 38,543ha for the main islands of Viti Levu and Vanua Levu. However, figures obtained from the government Department of Forestry for their 1999 Annual Report, gave an estimate of 42,464ha covering the five major islands of above and including Kadavu, Ovalau and Gau. While mangroves are present also in other islands, acreage and extent are minimal comparatively nevertheless, they need attention towards sustainable management. The figure therefore provided by Forestry Department could be relied upon as the technology of remote sensing was used in arriving at its estimate. 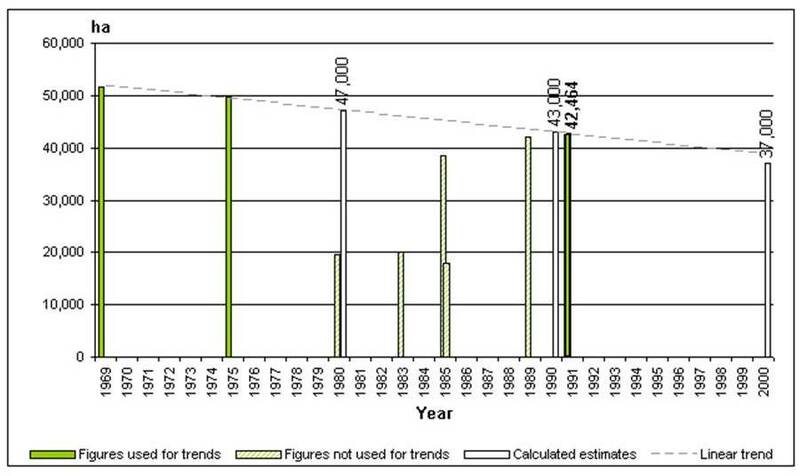 Coinciding with global developments, the trend in Mangrove area extent is negative. Fiji’s mangroves are made up of seven main species of trees, and several associated plants. The trees can be categorized into three functional groups depending on growth habits. Red Mangroves (“Tiri”) grow at the water’s edge, with “prop” roots that stabilize trees in soft mud and wave zones. The sap is red in colour. In Fiji there are two species of trees which live in this manner, and one sterile hybrid when both species are present –Spotted Mangrove, Samoan Mangrove and Hybrid Mangrove. 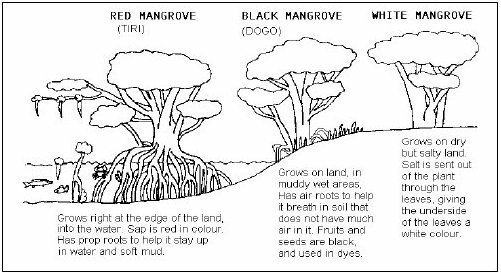 Black Mangroves (“Dogo”) are usually found behind Red Mangroves, in muddy areas that flood at high tide. They may have “prop”, or “elbow” roots that stick up out of the mud, sometimes both. The fruits and seeds are black and used in dyes. In Fiji there is only one species of Black Mangrove – the Large-Leafed Mangrove. White Mangroves are often not recognized by the layman as part of the mangrove community. They are very salt-tolerant trees that grow on dry land immediately behind the wet mangrove areas, and can survive occasional salt-water inundation, and salty soil. Salt is sent out through the leaves, giving the underside of the leaves a white colour. In Fiji there are several species of trees which live in this environment – Teruntum Merah Mangrove, Looking Glass Mangrove, Blind your Eye Mangrove and the Cannonball Mangrove.